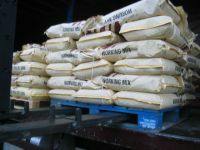 No Manual Handling - If a driver needs to manually unload the bags this can not only be time consuming but can often lead to problems with personal injury. Back injuries are common with manual handling of this type and can lead to many costly weeks off work. Increased Efficiency - The Palfinger Crayler allows your driver to unload upon arrival, without the need to wait for a customer's forklift to arrive. No waiting can have a large effect on the amount of deliveries possible per day and makes delivery planning much easier. 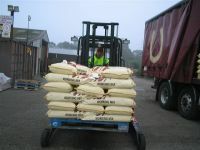 Customer Service - Using a Palfinger also removes the need for your customer to manually unload the bags or meet the lorry with a forklift. This can be a large benefit to the customer during busy times of the year. Furthermore the mobility of the Palfinger allows the delivery to be postioned just where the customer requires including narrow areas not accessible with the lorry or inside buildings. This level of customer service has proven to increase the business for Palfinger users.